Jeff Curto's "Camera Position" has quickly become my favorite Photography blog/podcast. Jeff Curto is a Professor of Photography at College of DuPage in Glen Ellyn, Illinois, who is also passionate about taking large-format (4x5) Black and White shots of Italy. What makes Camera Position different than many of the other blogs out there is that it is based on the creative side of photography. It is more about learning to "see" how the picture is created and understanding what is behind the pictures. It is about moving from snapshots to images that tell a story. Some of the episodes focus on the work of Master's such as Ansel Adams and Weston. Jeff even mentioned using the "viewing card" which Adams is famous for. (Which is a cardboard square with a hole the size of the negative cut-out of the center to be used for scouting). Curto also encourages us to slow down our photography and search for the "right-shot" by moving around and looking for the best angles. I listen to Jeff's podcasts when I'm driving back and forth to work. The only drawback to this is that I always want to go out photographing instead of going to the office. If you love photography, I think you'll learn a lot by listening and reading Jeff's blog. The old Railroad Crossing sign at the Folkston depot has starred in several of my photographs over the last few years. When I was in Folkston back in April, I was trying to look at the sign in a different way to find a new shot. For me, taking a photo with the camera at anything but vertical or horizontal just "feels strange" but hopefully it worked. I know these days, you can use the processing software to tilt and turn photographs after the fact, but for me it is more a chance to look at things from a new angle. I'm hoping that it will motivate me to look for other shots where something isn't as I expect and be willing to take them. I really enjoy the work of Ansel Adams and O. Winston Link. Most photographers have heard of Ansel Adams and seen his work, but many non-railfans might of never heard of O. Winston Link. He is most famous for his night photography on the Norfolk and Western Railway in the late 1950's which is some of the most classic images in the railfan world. It's something that everyone else is not doing. Most people are shooting color images and video. I'm looking for Black and White images, and usually taking some color as "snapshots" or because the subject doesn't do well in Black and White. I'm partially color-blind aka color-deficent. Yes, I can see in color, but a lot of the time what things look like to me is a lot different than what it will look like to you. This is really noticable in things like Browns and Greens, along with some reds. Thus that tree doesn't really look the same to me as it does to you. In that realm of not knowing what you have, when I took this picture at Santee National Wildlife Refuge, I didn't see the butterfly on the left hand side when I looked in the LCD viewfinder. I actually thought I had missed it. For some reason, I didn't delete the shot from the card, but left it there. I was happy to find the butterfly "fly-away" shot when I looked at it full size. Here is a picture of a beaver that I took last week at Phinizy. 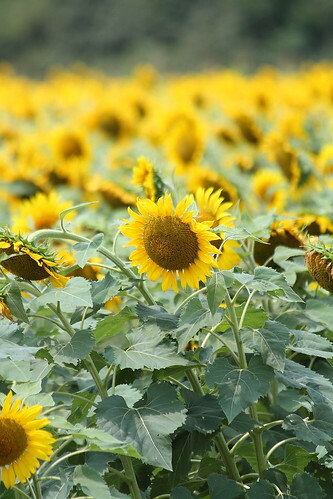 sunflowers, originally uploaded by Gene Bowker. This was taken in May 2003 at Mabry Mill on the Blue Ridge Parkway in Virginia. KODAK Store Daily Deal. Limited Time Only. Get Yours Now! Shot on Edisto Beach in November 2009, I was amazed at the variety of shells which were washed into this pile. Even more amazing is that no one had taken them home. Meesha, originally uploaded by Gene Bowker. Our cat Meesha.. in Black and White. Rails, Road, and the River converge at The Elkhorn Inn in Landgraff, WV. Cindy and I will be visiting again over Labor Day. You should come join us! Great food, great scenery, great friends. 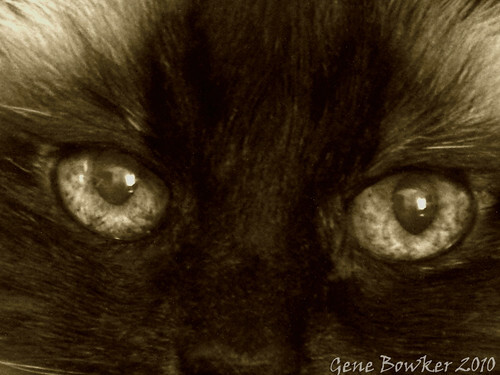 If you enjoy my photographs that I share on here, I hope you will visit my on-line portfolio at http://genebowker.com/. I'm working to get more of my favorite photographs moved over to the new site and also to make it easy for you to find what you are looking for on the site. I love the new server (zenfolio.com) and believe that it offers a great way to display my photos in the most professional way. A few more of my shots from this weekend up in West Virginia. These were in the garden at the Elkhorn Inn.